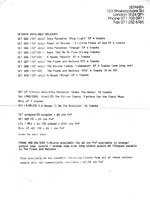 7" (Setanta, 12/11/1991): MPO CAO 002 – 500 - 1,000 copies ? Often considered as a true single, this release is overrated by many collectors as it is just a sampler. The Divine Comedy song is ‘Jerusalem’, the original B-side of Timewatch which was just released at that time. That promotional 7” was actually issued to promote a ‘Setanta night’ at London’s Camden Underworld in November 1991, the record features a song from each band who played that night. But the disc was probably made available by mail order by Setanta later. 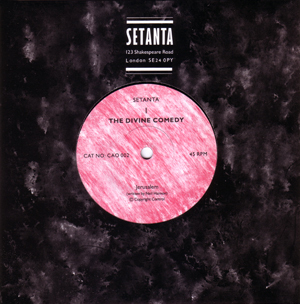 Original releases came with a Setanta catalogue of their first releases. They include Fanfare For The Comic Muse and Timewatch as well as a cassette compilation.